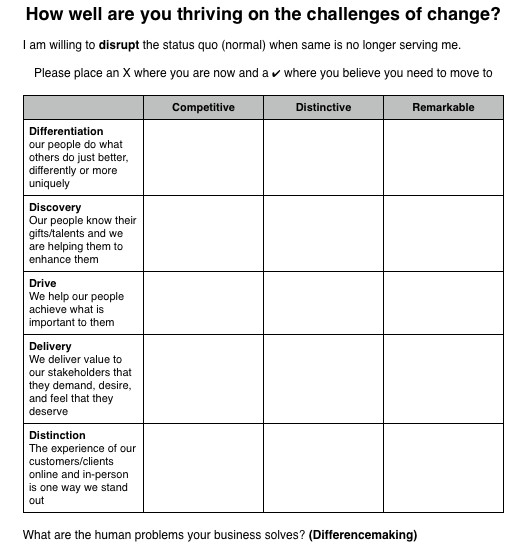 differencemakers community blog: What are the human problems your business solves? There are 7 keys to thriving on the challenges of change in your life and work. One I call differencemaking - the human problem/s your business solves. Differencemaking is the purpose (the why, the intent, the reason) for our businesses. Fulfilling our purpose is all about our performance in the areas pictured below. The above diagnostic is part of a paper I have produced about these 7 areas called The Delightful Design of a Distinguished 21st century business. To download my paper please go here and scroll down to the bottom of the page. When you complete, scan, and email the diagnostic to me I’ll provide you with complimentary high value briefing.